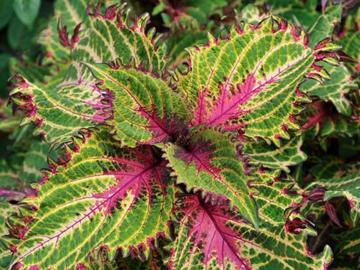 Attractive wavy-edged nettle-like, variegated leaves of deep violet-purple, red, green and yellow. Tender perennial. Relatively insignificant small blue and white flowers. Moist, well-drained, humus rich, fertile soil in part shade or sun if kept watered. Needs consistently warm conditions. Often treated as an annual.